Thank you to Harper Collins Children's Books UK for sending me this book via Netgalley in exchange for an honest review. A book about Demons, cannibalistic cars, serial killers, witches and vampires? I'm sold! 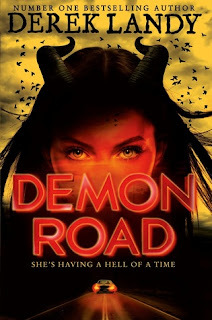 I have never had the pleasure of reading any of Derek Landy's work before, but I had heard a lot about him, so I was rather intrigued and excited to read Demon Road, the first book in a new trilogy. This book was unlike anything I had read previous, and it takes you on one hell of a ride! Demon Road is about sixteen year old, Amber Lamont, who until now has lived a normal life, despite not having a close relationship with her parents and lacking friends; instead turning to online forums for comfort. That is until one night when she finds out her parents are actually demons and in order for them to grow stronger and keep up a deal they made years ago have to eat her. She is forced to run away if she wants to live and go on a roap trip across supernatural America with the mysterious Milo, and later on, sweet, but slightly annoying Irish teenager, Glen. During the trip the trio encounter many supernatural, and quite shocking sights, including a city run by vampires, a serial killer with a weird obsession and witches. This book is certainly fast paced and full of action and like I said at the start is unlike any book I have read before. As soon as you open the first page, I promise you you will not want to put it down! 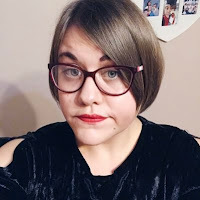 I loved finding out about the supernatural beings they encountered, and I admit I did jump and get startled at some parts. I've read many books about the supernatural before, but none of them quite live up to what I read in Demon Road. There were a huge range of characters in this book, some you love, some you hate and some you just wish weren't there at all. Amber isn't your typical YA heroine. She's awkward, overweight, average looking and tends to make wrong decisions almost all the time, but despite that she is strong, determined and very tough (especially when she's in her demon form). I loved her from the moment I was introduced to her and I was always rooting for her and hoping she pulled through from the situations she found herself in. Milo, I found it hard to warm up to him at first but as I got further and further on into the story I started to understand why he was the way he was and I'm glad we found out about his past. Glen, oh I had a soft spot for him! Although he seemed like this annoying teenager who just wouldn't shut up, I really just wanted to give him a hug and just be his friend. It does seem like he was trying too hard to please Milo and Amber at times, but all he really wanted was to be part of something. There is a lot of gore, blood and pretty scary happenings in the book, which may scare some readers, there were some pretty graphic parts that made me question if this should really be appropriate for young readers, but it all depends on what scares you I guess. I didn't really get scared, just a little bit grossed out at some of the descriptions. However, that doesn't take away anything from the fantastic storyline. Demon Road was a really interesting, original, fast paced read that takes you on an epic journey. I was drawn into Landy's world of the supernatural, and I really wish I'd discovered him sooner. He's a real talent to the literary world and Demon Road just goes to prove that.